This is the second of four innovative tools we're looking at in the Better Twitter Analytics series, seeking a new way of looking at data to help you shape and improve your nonprofit's social media strategy. 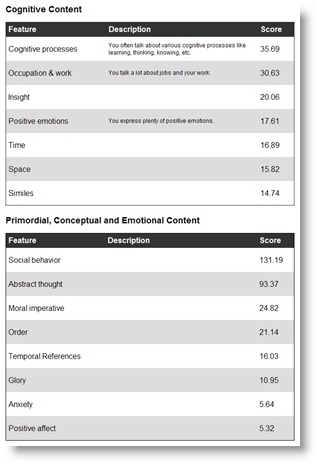 Among the new Twitter analytics tools, TweetPsych stands out because it comes at the data from a very different perspective — analysing the words used in your last 1000 tweets to present a “psychological profile” and to suggest other Twitter users who "think like you." Tweet­Psych uses the LIWC and RID [linguistic analysis methods] to build a psy­cho­log­i­cal pro­file of a per­son based on the con­tent of their Tweets… [and] works best on users who have posted more than 1000 updates. It is also bet­ter suited for run­ning analy­ses on accounts that are oper­ated by a sin­gle user and use Twit­ter in a con­ver­sa­tional man­ner, rather than sim­ply a con­tent dis­tri­b­u­tion plat­form. … I think the pos­si­bil­i­ties of a sys­tem like this are enor­mous, from match­ing like-minded users to iden­ti­fy­ing users that exhibit cer­tain use­ful or desir­able traits. But is TweetPsych a must-have tool for your nonprofit organization? Granted, TweetPsych is still in beta (very much still under development), but it would be helpful to have more information attached to the numbers and labels — an explanation for those of us whose undergrad psychology courses are now little more than a foggy memory. As is, it’s difficult to assess what this tool is telling us, and what actions we might take as a result. And remember, numbers are only as good as what they can tell us about what "next action" we might take to be more effective in reaching our goals! Add to that the fact that many of us stray far from our natural language patterns in trying to fit a message (but, often, a link and/or someone else’s username) into a 140-character limit. And, of course, the tool is designed for individual use, whereas many nonprofits on Twitter have an aggregate account, where several staffers or volunteers share the task of creating the content…Well, you can see the challenges here. Have a peek at TweetPsych, by all means — if only for another way of looking at your Twitter content, and maybe a general sense of how you’re coming across on Twitter — but I think you’ll glean more actionable ideas from DanZarrella.com, the blog. Do check out 5 Steps to Going Viral on Twitter (a guest post at CopyBlogger.com), too, as well as this video of Zarrella’s recent HubSpot webinar, The Science of Social Media Marketing.